So this past fall, Native Instruments comes out with their very own controller/mixer called the Kontrol Z2. I didn’t know what to think, but there were a few reviews and a video from DJ Craze that showed what this mixer could do (video below). As you can see from Ean Golden’s video, this mixer has a simplistic integrated set up for your Traktor Scratch software (if you are a part of the Traktor Scratch family) and it is affordable. It sort of removes the clutter of having an X1 and Kontrol F1 right off to the side of your turntables. So this product looks like it’s worth checking out to me. This past spring and summer, Serato and Rane worked together to bring the DJ community the SixtyOne andSixtyTwo mixer(s). And with the World Famous Beat Junkies representing their products, D-Styles did a little showcase video for them on youtube. Check out this video of current DMC World DJ Champion DJ Vajra getting down on the new Rane Sixty-One mixer. Check out Rane’s website for the Sixty-Two as well. 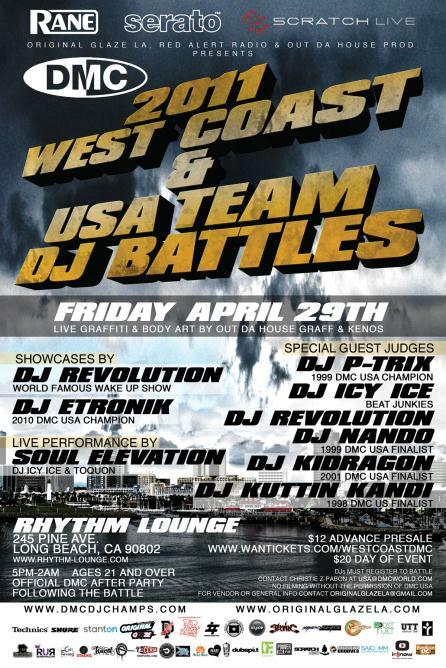 w/ Judges, Performers and Special Guests to follow the battle. For the classic showcase style DMC battle (which now allows Serato) DJs should have a 2 min. elimination set + a 6 min. finals set prepared. Teams should have no more than 4 members – must prepare a 6 minute team set. The 2011 DMC DC Champ will win a choice of either SL 4 for Serato Scratch Live or TTM 56s Mixer!!! Here’s the first 5 minutes of Disney’s Epic MIckey for the Nintendo Wii. From the looks of it, it looks pretty sick. Release date should be around the holiday seasons. You can check on the link below for some more info. Was checking out skratchworx.com and saw this video for a new MIDI Controller called the Quickswitch. This is an added on device to your current turntable set up so consumers can avoid buying those Vestax Controller One turntables that cost a grip of money. And if you do have a Controller One turntable, Quickswitch has an add-on for your turntable to access samples, effects and what not next to your mixer (peep the video). It kinda reminds me of Native Instruments Kontrol X1 controller for the Controller One turntable. Anyways, I wanna see where this is gonna go. Check out Quickswitch’s website about their current project.